The new report from Oil Change International (Greg Muttitt was the principle author) is a major event. It’s called The Sky’s Limit: Why the Paris climate goals require a managed decline of fossil fuel production and it has garnered quite a bit of praise from the greenie press. (See for example, here, here, here and here.) It deserves the praise, and it also deserves a closer reading. There are two especially notable comments on the report, Bill McKibben’s Recalculating the Climate Math and George Monbiot’s What Lies Beneath. The first because it very clearly explains why we must immediately stop investing in fossil infrastructure (and it was McKibben who in 2012, with his blockbuster Global Warming’s Terrifying New Math, first drew the political implications of “the carbon budget approach” out into the public discussion). The second because it displays all the virtues of Monbiot’s usual bitter realism, and because it’s marred by a small but instructive overstatement, one to which I will return. In the report’s core, OCI draws out a new and critical implication of the carbon budget approach. It does so by going beyond the now classic Carbon Tracker analysis (the foundation of McKibben’s 2012 article), updating it by focusing not on the entire body of fossil-fuel reserves, but on the smaller set (roughly 30% of the “proven” reserves) of reserves that have already been “developed” – the “oil fields, gas fields, and coal mines that are already in operation or under construction.” By so doing, OCI is able to harness the vast power of what some wag, somewhere, once called “the first law of holes” — when you’re in one, stop digging. * The potential carbon emissions from the oil, gas, and coal in the world’s currently operating fields and mines would take us beyond 2°C of warming. 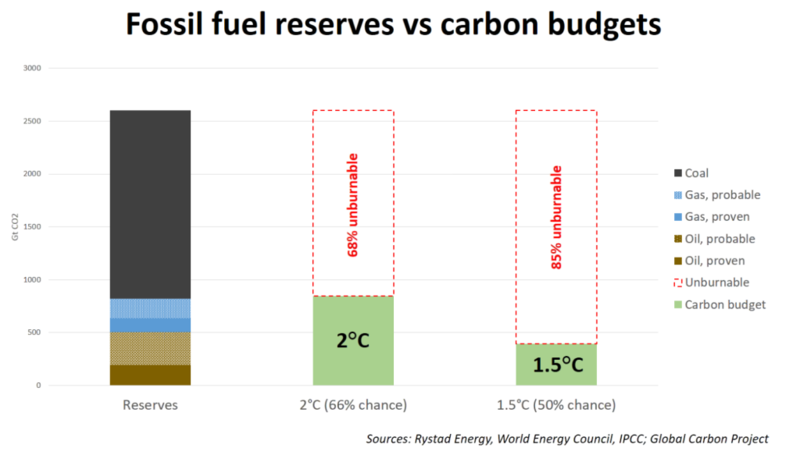 * The reserves in currently operating oil and gas fields alone, even with no coal, would take the world beyond 1.5°C. * With the necessary decline in production over the coming decades to meet climate goals, clean energy can be scaled up at a corresponding pace, expanding the total number of energy jobs. All this is absolutely critical stuff. It’s news that will stay news. But there’s more. Beyond its “developed reserves” argument, The Sky’s Limit has other points to make, and they have been far less widely appreciated. Let’s talk “stranded assets.” If you’ve been following the debate here, you know that anxiety about “unburnable carbon” is running high, even in (especially in?) the financial sector, including core banks such as HSBC, and Citi, and the Bank of England (or at least in the mind of its current Governor, Mark Carney). There’s an easy way to think about the issues here. Consider the risk that we might one day wake up and decide not to destroy the Earth as we know it, and our civilization to boot, by irredeemably destabilizing the climate system. You may judge such an event to be likely or unlikely, but the point is that a meaningful climate mobilization is still possible. It could happen. And if you’re a big time money manager, and you’re not thinking about the possibility that humanity might yet act, and at scale, then you’re not doing your job. Because once we take the science seriously, we see that (absent the discovery of vast herds of “carbon sucking unicorns”) we have to phase out carbon-based fuels so quickly that it would inevitably involve the catastrophic devaluation of one the largest sectors of the global capitalist economy, the fossil sector. And all else being equal (the way we usually manage things) this would set off the mother of all economic crises. Nor is that all. Even if there was no climate crisis, there would still be the renewables revolution, which is finally reaching its inversion point. And as renewables drop rapidly in price, even as their efficacy increases, they too are destabilizing the energy markets. We’re generally pretty blithe about the issues here, but the truth is that any sufficiently rapid low-carbon transition will be tricky, disorderly, and dangerous. And not just dangerous to the fossil-fuel corporations. Chaos in the fossil sector would provoke chaos in the energy economy as a whole, and the larger global economy, and given today’s insane level of economic stratification, and the sorry state of our governance, this story is by no means guaranteed to have a happy ending. Which is why it’s a terrific relief that, recently, easy talk of stranded assets has been joined by quieter and perhaps more serious talk about planning the “managed decline” of the fossil sector. Much of this talk has been quite solicitous of the fossil corporates. See for example Sense and Sensitivity, a Carbon Tracker report that tells us that “Oil majors could be worth up to $140 billion more by aligning production with climate targets.” It’s a message aimed at the elites, and no doubt it’s both true and useful, but if your central concerns are the broad coalitions and popular mobilizations that could actually support an emergency fossil phaseout, it might strike you as being just a wee bit too accommodating. In this context, too, The Sky’s Limit is a welcome balm, for it puts the “just transition” problem front and center, and it does not do so (as Monbiot incorrectly suggests) by arguing that “shutting working mines and wellheads means confronting and compensating companies that have invested heavily in production.” Rather, it focuses on the core of the just-transitions challenge, which very much does not include the fossil corporations. To be clear, this challenge is every year seen in more expansive terms, and the term “just transition” long ago ceased to invoke only the plights of the workers and communities whose lives will be upended by any rapid fossil energy phase-out. But this hardly means that we should speak of companies as legitimate candidates for climate transition assistance. My own view is that companies, creatures of the market, should die by its logic just as they live by it, that “creative destruction” is a welcome part of the transition toolkit. This is going to get complicated, but let’s at least start off by being crystal clear. What OCI actually says is that “Shutting an existing asset leads to an investor losing money, and if a government shuts it by decree the investor will demand compensation.” The question is how to prioritize those demands against the needs of displaced workers, impacted communities, and developing nations. Justice is one of the issues here, and political power is another. We should not confuse them. * No new fossil fuel extraction or transportation infrastructure should be built, and governments should grant no new permits for them. * Some fields and mines – primarily in rich countries – should be closed before fully exploiting their resources, and financial support should be provided for non-carbon development in poorer countries. * This does not mean stopping using all fossil fuels overnight. Governments and companies should conduct a managed decline of the fossil fuel industry and ensure a just transition for the workers and communities that depend on it. This approach makes sense, because it highlights the problems that non-carbon development poses for poor people and countries, and puts justice at the center of the “managed decline” debate. This debate is only now beginning, so there’s lots of detail to flesh out, but this report is a good, clear place to start. Step back and examine the overall logic here. On the one hand, a global limit on fossil infrastructure investments, one calibrated to the implacable logic of the carbon budget. On the other, a simple frankness about the equity challenges that that such a limit implies. The key thing is that these two approaches, taken together, define an approach that can finally link the campaign logic of the climate street with the logic of “astronauts” (Wolfgang Sachs) who insist on thinking globally. Which is great because, to have any real chance of holding the Paris temperature targets, we’re going to have to stop building fossil-extraction infrastructure, and as soon as possible, and a shared and coherent sense of what this implies could only be to the good. Which is why we need a compelling transition narrative, one that pays due respect to political-economic and technological realities, but also prominently features the equity problems that will lie, inevitably, at the heart of any really rapid climate transition. “The duty to cut emissions rests more with countries that carry greater responsibility for causing the problem (those with greater historic emissions), and with those that have most capacity to act (the wealthiest countries). Industrialized countries, which account for just 18% of the world’s population, are responsible for 60% of all historical CO2 emissions. The question, as one attendee put it, is “Who gets to pump the last barrel of oil?” It was just a joke, of course. The real question is how to manage the tangle of transition problems that the climate crisis thrusts upon us. Many of these are justice problems — fair shares, just transitions, energy access, stranded assets, adaptation, loss & damage – they all come to mind. Curiously, there’s something about the supply-side approach – “keeping it in the ground” – that seems to make these core issues clear. We’re going to have to draw global emissions down to near zero, and fast. This will be fantastically difficult, and you may be forgiven if you believe, secretly or otherwise, that we will fail. But we have to try – how else can we live? – and this means we have to ask ourselves the hard question – how can we win a climate transition that’s fair enough to actually work? * To achieve the Paris goals, no new fossil fuel extraction infrastructure should be built in any country, rich or poor, except in extreme cases where there is clearly no other viable option for providing energy access. * Since rich countries have a greater responsibility to act, they should provide finance to poorer countries to help expand non-carbon energy and drive economic development, as part of their fair share of global action. Particularly important will be financial support to meet the urgent priority of providing universal access to energy. Around the world, over a billion people have no electricity in their home. Nearly three billion rely on wood or other biomass for cooking or heating. Lack of access to energy in households and communities threatens the achievement of nearly every one of the Sustainable Development Goals that the international community has set to fight poverty, hunger, and disease. * To stay within our carbon budgets, we must go further than stopping new construction: some fossil fuel extraction assets must be closed before they are exploited fully. These early shut-downs should occur predominantly in rich countries.